A fan exchanges words with several Thunder players. It’s not clear what prompted a bizarre episode in Atlanta, where a lucky — or unlucky — fan got a rare, up-close meeting with a few Oklahoma City Thunder players. As the Thunder dribbled out the clock in a 101-92 victory over the Hawks, Kevin Durant walked over to a pair of fans seated near midcourt. 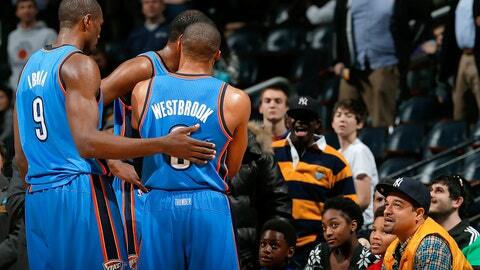 Durant and the fans had a brief exchange before Russell Westbrook, Serge Ibaka and Kendrick Perkins sidled over. The players conversed with the fans for a few more moments, and while nobody appeared to get emotional, Ibaka and Perkins did slightly nudge Westbrook away and usher the Thunder guard back toward the bench. Durant had this to say to NewsOK.com after the game regarding the exchange: "He really respected how we played the game. He just wanted to tell all of us one-by-one." We’re glad sarcasm is not lost on you, Kevin. Check out the strange interaction below to judge for yourself.